Despite my rain fears, it was a rain-free game in Berkeley. And it was a good one. If I felt uncomfortable after a 30-point win versus Louisiana Tech, why should I feel much better after an 18-point win over Arizona? Maybe it’s because the game, despite a late Arizona rally, was never really that close. Cal’s offense clicked more than it has the entire year, highlighted by a 28-point outburst in the first quarter. Tedford’s play calling in that first quarter was brilliant — you could actually see Cal zig every time Arizona zagged, passing when Arizona seemed to be playing the run, and running when they played the pass. Longshore, who we have established can be streaky when it comes to passing, was on a hot streak. Justin Forsett, when he started running, ran with authority. And when he came back in the game late, after a James Montgomery fumble, he shredded the Arizona defense like a man among boys. After you go up 28-3, and then 31-10, there’s going to be a letdown. And there was. The offense played more conservatively, and Longshore was a bit less accurate — though he wasn’t helped by some drops by his receivers. The defense softened, which (again) I can’t really fault, since they were up by three touchdowns at that point. And it’s pretty hard to defend that crazy Texas Tech-style offense, especially when they’re always in the spread due to being behind by 21. And how about that Thomas DeCoud? He was everywhere. Here’s what I didn’t like: The turnovers. Longshore threw a couple shoulda-been-intercepted balls, plus the interception. Montgomery’s terrible fumble. I also didn’t like the stupid penalties, especially late in the game when Cal had reasserted itself. Use your head. I also didn’t like Mike Stoops very much. He lost it a few times on the sidelines, which didn’t impress me. I really appreciated his playcalling in last year’s Cal-Arizona game, where he boldly went for it on every occasion because he knew he couldn’t win otherwise. And he won, in the game that ended up being the reason Cal didn’t go to the Rose Bowl. Ouch! But this year? Not so much. With 13 minutes to go in the game and trailing by 14, Arizona opted to kick a 32-yard field goal. I found that pretty weak, since it cut the game from two scores to… two scores. But okay, if you’re going to play the incremental-scoring, then why go for it later on 4th and 9 at the 16 when you’re down by 18 again? A field goal in that situation brings you within two scores, and yet Stoops opted to go for it. After a false start penalty, they went for it on 4th and 14. It just doesn’t make sense, certainly not from a pure strategy perspective. Perhaps it was an emotional decision: Stoops might have figured that a touchdown to make it 45-34 would pump up his team in a way that a field goal to make it 45-30 wouldn’t. But at that point, the Wildcats needed three scores, and Stoops bypassed a short field goal. Dumb. And when they failed on 4th and 14 with four minutes left, that was the end of the game. Short Takes: These will be really short, because I’ve got a super-early flight in the morning… All my game photos are here… Not a huge game for DeSean Jackson, but his presence caused at least one terrible punt — you’ve got to figure that punters used to kicking normally have to adjust their approach knowing he’s back there, and sometimes that simply leads to terrible kicks… My spies tell me that Versus, which televised the game, makes CSTV look like the pinnacle of broadcast excellence. Versus lost its signal for a while and aired nothing but commercials, and the main camera looked like it was mounted on the cannon on Tightwad Hill…. With the A’s on the road, AnnouncerBot 2.0 beta was reinstalled to the P.A. system, and the world yawned… The alumi section’s Mic Man today was on some severe tranquilizers. I half expected him to start reading his poetry to us. Not that I’m complaining — it was easy to tune him out… Cal is averaging 42 points per game through four games, for an average score of 42-25. Crazy! But it gets harder next week versus Oregon at Autzen Stadium. A lot harder. I’m not nearly as worried about Oregon after watching them give away 24 unanswered points in the second quarter. Going into the game, Oregon’s total defense was dead last in the Pac-10, and today’s games couldn’t have helped life it much higher. I actually feel like Cal can pull it off next weekend. This is a nice feeling as I was so guilty of looking ahead today, and lacking much optimism! If Stanfurd can pass the ball down the field at will, just imgine what Longshore can do!! I don’t know how you can fault the team for the bulk of those ‘stupid’ penalties. Those calls were utter hogwash of the third degree. The ‘roughing-the-passer’ call especially; one of the flags was throw WELL BEFORE Tui threw the ball. How can you be called for roughing the passer when the QB HAS THE BALL?! And the very next play, Sydquans “helmet to helmet”? What the hell, is he supposed to tackle with his shins? How about Oregon being on the road? Maybe that played a small factor before they were able to adjust for the second half? I agree with you after watching Oregon play, I’m less worried about next weeks game but playing at Autzen will be tough. All in all, a wins is a win. 4-0 and looking good thus far. Go Bears! I’m very worried about Oregon. Thier offense seems crisp and explosive. Can we say the same about Cal? Not yet. The potential is there but I still feel like the offense is missing something. No long TD passes, no deep threat. DeSean doesn’t have a single receiving touchdown. Quarter-long funks filled with ugly three and outs. If you think the Oregon D is a bad I’m curious what you think of Cal’s D. Remember, Arizona dropped 27 points on the Bears playing a similar version of Oregon’s offense, albeit with better skill players. Sure, it was pretty much garbage time and there’s the question of letdown with a big lead, but still. Based on what I’ve seen this year with Cal’s D, Oregon is going to move the ball pretty much at will against Cal, and it is going to be up to our offense to stay with them. 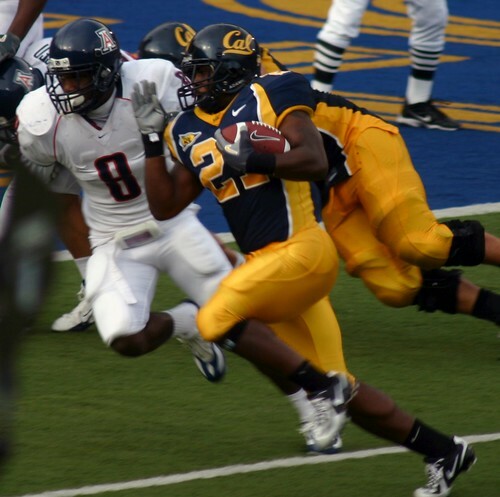 If Cal’s offense goes dormant for a quarter or so like they have almost every game this year it won’t be pretty. 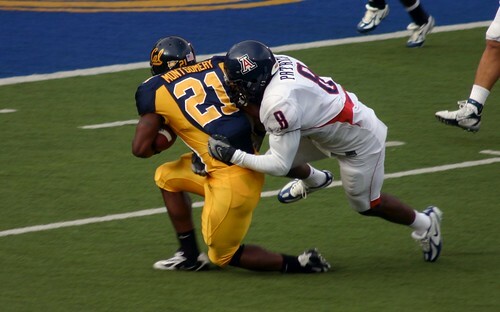 Simply put, if Cal plays anywhere near the level they did against Arizona it will be ugly in Autzen. Ugly. The Cal I’ve seen play the past three weeks will not beat Oregon. The Cal I saw play the Vols can and will beat Oregon. I don’t mean to be a pessismist but that’s how I see it. Go Bears! Huge game next week! Agreed joshiemac. This Oregon game is huge, as was the Tennessee game, and if the Bears can step up and play a sharp game, we should be OK. Oregon was on the road and I am sure they approached the furd much the same way we approached La. Tech. You could see that once Oregon made their halftime adjustments they destroyed the furd. I am wondering if this Oregon game would have been better in week 2, just because we need the Tenn. intensity to have carried over. If we can play with that much focus and intensity, the game will be close, but we should win.